Ok, that’s enough of the cod-Montaigne ‘post’ captions beginning ‘of,’ i.e. ‘about.’ Probably I should drop the date-lines, too, because it sometimes feels like I’ll never catch up to the present. And who’s interested yesterday’s news? Maybe after next Monday… It occurs to me that Montaigne was in some ways the prototype blogger, albeit using quill and vellum and needing a far longer dissemination time than today. In his utterly wonderful Essays (which I strongly recommend as the perfect bed-time reading to anyone who doesn’t know them), he launches into quirky discussions of whatever interests him, heedless of whether he’s going off track from the topic apparently under discussion; and there’s a strongly engaging autobiographical streak which allows one to track the development of this amazing personality over several decades – and his increasing physical problems, about which he’s particularly frank. I continue to feel a bit overwhelmed by the kindness of friends, even people I don’t know so well. One such is another Tim, a family friend of the Hartnells. At Caroline’s suggestion, he and his family came to stay at my old place in France for a week after his partner Sarah died. I was more than happy with the idea. Without Sarah, I doubt Maddy would be with us now. Despite the attention of endless doctors and mid-wives, no-one noticed that our little girl was upside down in Anna’s womb until after the nine-month term was complete (the other face of the NHS!!) I’d often thought it odd that the top of Anna’s bulge felt so hard but, of course, one tends to defer to the ‘experts,’ especially first time having a child. Once Maddy was a day or two late, however, an increasingly uncomfortable Anna phoned Sarah, who’d had a long career as a mid-wife. She suspected something was wrong and urged Anna to go straight to her G.P. surgery, where they at last diagnosed the problem. We were told to report at 7 the following morning to St Thomas’ Hospital, where an emergency Caesarian was performed. Not only was poor Maddy wrong way up, but the umbilical was wrapped round her neck. I still shudder to think how easily we might have lost our darling if it hadn’t been for Sarah, who herself finally succumbed to cancer the following year. I think it helped Tim and his family to have a break in the Pyrenees, where we did some amazing walks, had wonderful meals and lots of laughs. Although I haven’t seen him in a couple of years, now Tim’s sent a card expressing his condolences and wishing me all the best. My near-neighbour Ben comes over to help with the blog. He’s another of the very interesting friends I’m blessed with. Although we overlapped as undergraduates at Durham, we didn’t meet until many years later. Ben first made a name for himself as a TV presenter and programme maker, then as the admired biographer of several unusual and interesting subjects, including John Dee, Nicholas Culpeper, and Ada Lovelace – Byron’s science-minded daughter (all three of which I can strongly recommend). But when the commercial bottom fell out of literary biography a few years back, Ben – partly at my suggestion – decided to do a creative writing PhD at Goldsmiths. He’s got his doctorate now and completed a novel but is still awaiting a break-through in this new career-path. Literary publishing is in such dire straits now that it’s a very tough environment, as I myself know (soft-hearted agents, where are you?) The closest we’ve come to any sort of collaboration was last summer, when he kindly agreed to take on the role of introducer / patsy interlocutor (I’d sent hime the questions I wanted asked) at the launch of my memoir at our local Waterstone’s. As I suspected he would, Ben finds the errant photos very quickly. They’ve nestled away on my back-up hard drive, rather than on the computer. Duh! He teaches me how to upload and resize them on the blog-site and after three hours’ patient tutorials and practice on these and other matters, I think I’ve got the hang of it all. He’s also brought some delicious polenta and pistachio cakes from his local café. Buggar the tumour, I’m not going to miss out on this. Over an accompanying cuppa, we reflect on my condition before he’s off home, promising to return and help archive all my Goldsmiths emails before I leave – whenever that may be. 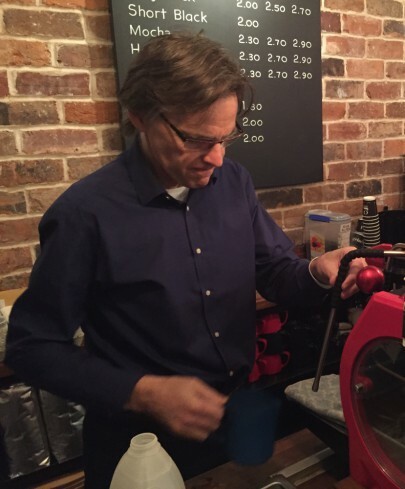 Ben: biographer, blog-meister, barista: is there no end to the mans talents? That evening, I add two more entries to the unillustrated trial one Anna and I published on the web-site without any publicity three days ago. Not without some trepidation. What if nobody likes the blog, or finds it in poor taste to so publicly discuss such private things? Then I tell a couple of people how to find it. It’s been a very satisfying process, despite all the hard work, especially the feeling of fashioning something positive out of this wretched turn of events. I head over to Anna’s, where I find Maddy and her friend Rosa dressed in Princess costumes. To help out Rosa’s mum, who’s single, Anna has offered to look after her every Monday evening until Imogen gets back from work – another example of a kind-heartedness which I find almost perverse given how busy she already is. The girls are full of mischief when I arrive, making me act out various ludicrous roles, from being a chicken to a doughnut. So far, I don’t think Maddy has the slightest inkling that anything is up, even if I haven’t been doing anything with her on my own for ten days now, fearing another attack. Let’s keep it that way for as long as we can. What will she think if I have to lose all my hair? Maybe she’ll want to paint it like an Easter egg. When I get home there are very encouraging responses to the blog from Sally and another friend, Richard Skinner. What a relief! I spend the morning preparing new posts, to check I’ve remembered everything Ben told me, before heading over to C and W for my MRI scan. This is the one to see if the tumour’s spread into the renal vein (and thence, presumably, potentially, to the rest of the body.) When I arrive for my blood test, however, I’m met with blank faces. They’ve received no documentation. A rather surly nurse tells me to go and fetch the forms. I bridle at his tone. ‘You go and get them,’ I retort irritably. ‘I’ve done exactly as I was told in this letter.’ I thrust it under his nose. ‘It says the paper-work will be ready. I’ve no idea where to go and search for it. You’ve cocked it up, so you sort it out.’ He’s abashed and sets off to do so. I feel a bit ashamed of myself. But I get irritated again when another nurse comes down, a pretty young Chinese-looking woman, apologising for her oversight. She introduces herself as the Macmillan Cancer nurse I was assigned on April 02 – who hasn’t returned a single one of my emails or calls (she never answers the phone) since then. ‘Why am I having to wait so long to get the kidney out?’ I snap at her. I’ve been asking her in much more polite and roundabout ways for some time now. ‘We can talk about this somewhere else,’ she conciliates, while my blood is drawn for what seems like the nth time since this process began. I’ve recovered my equilibrium by the time we sit down in a nearby room. In fact, I soon find myself liking her. She’s probably been well-trained to deal with the irrational anger of cancer patients but she certainly gives the impression she cares. She explains that I’m being fast-tracked through the system. Hard to believe, but no doubt she’s right. There’s just so much demand. She answers my questions about diet and exercise – advising no change in either respect. Can I really go swimming again? What if I have a seizure in the pool? We discuss the financial, psychological and physical aspects of what lies ahead. But she can’t be very specific about what the latter might involve until all the scans have been completed and processed. As she takes me up to the floor where I’m to have my MRI, we chat amiably about Singapore, where she’s from, and how it compares to London. MRI is the weirdest experience I’ve had so far, quite unlike CT or Ultrasound. I’m relieved to learn that no X-rays are involved. Another injection of gunge to highlight the soft tissue. This one is quite painful but the nurse rebuffs my protesting grimace as if I’m making a silly fuss. I strip, put on a gown, lie down and have headphones placed on my ears (as protection against the noise, I’m told). When I’m fed inside the MRI tunnel, bedlam breaks out. It sounds like I’ve been launched into some mad X-box games gallery. Ratta-tatta-tatta-tat comes the machine-gun fire; dudd-dudd-dudd, the answering artillery. Every so often there are the kapows you get with bulls-eye hits on your on-screen enemy and the eery wail of cop car sirens. Jacka-jacka-jacka, the machine judders from time to time, as if I’m being moved backwards and forwards. What on earth is it all for? I close my eyes, thankful for the head-phones, through which a woman’ voice from the next room instructs me to ‘breathe in…hold your breath…now breathe out and relax.’ Once, when she forgets to tell me to breathe out, I almost gag. O for the reliability of the CT machine’s HAL-like voice. Afterwards, I head for the nursery playground near Blundells, where I meet up with Anna, Maddy, Rosa and her grand-dad, who helps Imogen out on other evenings of the working week. Maddy tries her best to keep up with Rosa and Gian-Luca, another nursery friend who’s a year younger. But she can’t manage it. I sometimes wonder if her hips got damaged during pregnancy. She was checked at birth and nothing was reported to worry about. So why can’t she seem to manage more than a speedy waddle? However, she climbs higher on the frames than I’ve seen her do before and she’s thoroughly enjoying herself, which is the main thing. I’m in a bit of a dilemma as time moves on. 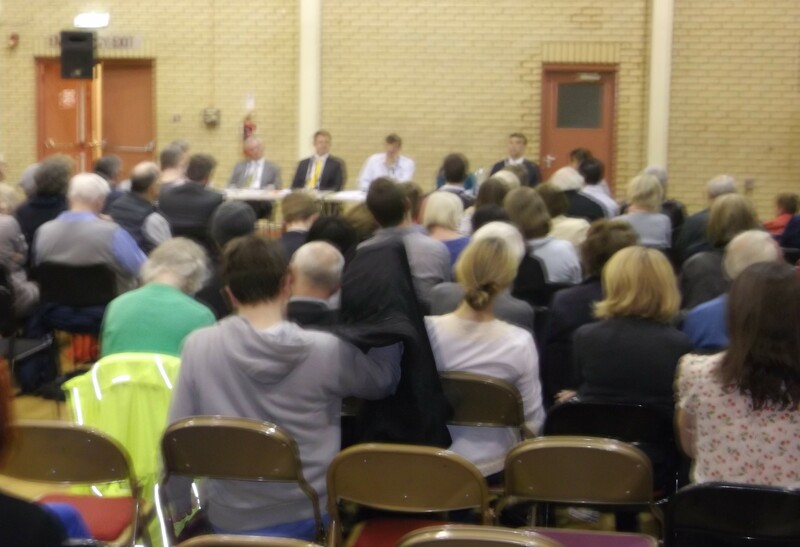 There’s a hustings this evening for the forthcoming General Election candidates for Battersea. Observing the Question Time format, I’ve already sent my questions in. But I’m feeling very tired. However, if I’m called up at the meeting and not there, they’ll doubtless be passed over. I submitted what I hope are a couple of killers for our sitting Tory MP, Jane Ellison, whom I’ve met a couple of times. She struck me as far too nice and sensible to be a Tory. She’s sympathetic to the Palestinian cause and against TTIP. But this is no time for sentiment. In a swing seat like Battersea, it’s just possible I can inflict some useful damage, especially as the hustings are being broadcast on local radio. Duty prevails and I bid the girls farewell. I stroll west along Battersea Park Road which is snarled up with rush-hour traffic, wondering how much this sort of pollution is contributing to the epidemic of cancer and other ailments of modern life. Perhaps I should be voting Green. I stop at a Brazilian rotisserie en route for a snack and listen to some young black hipsters discussing how they can emulate the success of So Solid Crew, Battersea’s best-known contribution to the genre of garage. I eat my chicken and rice and head for the community centre on the fringes of the Winstanley, a gigantic and troubled public housing estate built to replace some of Battersea’s then-notorious slums and bomb-damaged housing after World War 2. But the chance to ask it doesn’t come. Perhaps because there’s already been one on the economy, which has taken up a lot of time? Or because mine has been deemed too specifically directed? Even when debate’s thrown open after the candidates have given their answers, I can’t seem to catch the moderator’s eye, however hard I wave my arm. He only seems to be interested in the genteel people in the first few rows. I manage to get in a few heckles, which draw disapproving glances from my neighbours. This is clearly not behaviour that the Battersea Society, which has organised the event, expects. When the Lib Dem candidate boasts that his party will put an extra £8 billion into the NHS, ‘and that’s a promise,’ I retort, ‘yes, like your one on tuition fees.’ When the UKIP fellow bangs on about how migrants are putting increasing pressure on the NHS, I remind him that one in four NHS doctors and 40% of its nurses come from overseas. I find the occasion increasingly dispiriting. It’s not just because I’m being ignored, or am fading fast, but because the event seems to symbolise everything that’s wrong with British politics. We’re on the Winstanley Estate, certainly one of the most ethnically diverse areas in Battersea, in turn one of the most diverse areas of one of the most diverse cities in the world. Yet all nine people at the ‘top table’ where the candidates sit are white. When I look around the audience, it’s the same story. Amongst probably two hundred people, a couple of ‘Asian’ faces, a single black one – and he’s technician working with the radio crew. Even more striking is the age demographic. A clear majority are pensioners, with no more than a sprinkling of under-40s. It’s quite shocking to see who conventional politics does and doesn’t engage these days. But it’s little wonder that so many people are turned off and turning away. The whole system is rotten from top to bottom (here I’ll let you into a dirty little secret. In the last two elections I naively voted Lib Dem, because of their commitment to changing from ‘first past the post’ to Proportional Representation. Once in coalition with the Tories, they made such a hash of it, that the possibility of a fairer system has vanished for at least another generation). Entirely understandable that the young, gifted, and black prefer to spend their evening in a Brazilian rotisserie discussing So Solid Crew. I bet even the radio technician wishes he was there. My mood’s not improved when I get home to find a despairing email from Haim. The organisers of the Southampton Conference have lost in their High Court appeal. I read the judge’s determination with astonishment. This means that in principle any group can now prevent any event on campus they don’t like. Merely by threatening trouble, they will licence cowardly university authorities to cite this legal precedent in order to refuse or cancel all manner of discussion, on ‘health and safety’ grounds. ‘Women’s Reproductive Rights?’ ‘So sorry, we’ve had calls from a pro-Life group.’ ‘Geology and History?’ ‘The problem is, you see, a Creationist organisation has been making representations.’ ‘The Rise of Neo-Fascism in Europe?’ ‘Thing is, the EDL might not be happy.’ Where will it end? Previous Previous post: Saturday-Sunday 11-12 April: Of boredom, banality and boosts to morale.